October 18, 2011 - To a transportation secretary, visiting Cleveland Hopkins International Airport is like visiting hallowed ground. This airport was the United States’ first municipal airfield, opened in 1925, and was home to the world’s first air traffic control tower and airfield lighting system. More recently, it was home to the world’s first direct link between an airport and a regional rail transit system. Yesterday, Raymond H. "Ray" LaHood a Republican politician from Illinois who is currently the United States Secretary of Transportation, who has having served since 2009 joined Federal Aviation Administrator Randy Babbitt in the Forest City to break ground on a new air traffic control tower at Hopkins. The new tower will serve the more than 194,000 aircraft arrivals and departures at Hopkins every year and its radar will manage all air traffic within a 30-mile area around greater Cleveland. As Administrator Babbitt said, “The new location for the Cleveland tower gives controllers a better view of airport operations and will ensure that they are prepared for the future of air traffic control.” That future is the FAA's Next Generation Air Transportation System, or NextGen. This technology will give air traffic controllers more precise, system-wide information about weather and flight data. “Projects like CLE’s new tower, which will create 100 construction jobs, are a big reason why I’ve been so excited about the American Jobs Act. As soon as Congress passes this legislation, we can put $1 billion to work reducing travel times and delays while improving safety through further investments in NextGen” said LaHood. “With $2 billion to invest in projects like modernized runways, taxiways, and terminals, we can also put construction workers back on the job upgrading airport facilities. “This is the country that built the first air traffic control tower, airfield lighting system and direct airport rail link. This is the country that pioneered many, many other innovations in roads, rails, and transit, the kinds of innovations that made American commerce and prosperity possible. “But the reality is that we’ve fallen behind on the maintenance needed to help keep America's economy competitive. In the 1800s, an earlier generation left us the Transcontinental Railroad. In the 1900s, the generation before mine left us the Interstate Highway System. Today, at the very least, we owe our children and grandchildren a legacy of transportation that continues to move parts, products, and people safely and efficiently. “There is no Democratic or Republican airport in Cleveland – everyone uses Cleveland Hopkins International Airport. And when they do, they have the right to expect that their flights will be safe. The tower we broke ground on yesterday will help ensure that those expectations are fulfilled. “But we can't stop at Cleveland Hopkins; in airports across the nation, there’s work to be done and workers ready to roll up their sleeves and do it. Let’s make sure that essential upgrades to our aviation system don’t fall by the wayside. Let’s pass the American Jobs Act”. The airport was founded in 1925, making it the first municipally owned airport in the United States. 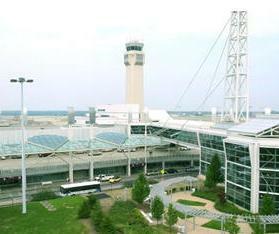 The airport has been the site of many other airport firsts: the first air traffic control tower, ground to air radio control and the first airfield lighting system, all in 1930, and the first U.S. airport to be directly connected to a local or regional rail transit system, in 1968. The airport was named after its founder, former city manager William R. Hopkins, on his 82nd birthday in 1951.